This review of the novelization for Star Wars: The Force Awakens contains SPOILERS for the book and movie. Written by Alan Dean Foster, the official novelization for Star Wars: The Force Awakens works well fleshing out certain characters, while filling in some of the blanks the audience is left with after viewing the film. Most Star Wars fans will recognize Foster as the author of the novelization for the original Star Wars (although it was initially credited to George Lucas), so this isn’t new territory for the author. It’s an appreciated ‘full circle’ moment for book lovers and fans of the saga. The novelization for The Force Awakens sticks closely to the events depicted on-screen. Perhaps a little too closely at times for my taste. Understandably, some constraints may have been placed on the author. This is not meant as a major criticism, by any means. The story just felt a bit ‘held back’ when I would have appreciated more creative interpretation. That said, I was grateful for the additional information doled out over the course of the book. How did Poe Dameron get off Jakku? You find out the particulars in a mostly satisfying way. More time is devoted to the scenes in Maz Kanata’s castle, including an appearance by someone from Rey’s not too distant past. Surprised no one lost a limb in the film? A pleasing scene in the book addresses that concern, and answers a long-standing curiosity about Wookiees involving arms and sockets. I was hoping Rey’s Force vision would have received more clarification in the novel, but the scene plays out well enough on the page. Additional time is spent on the science behind Starkiller Base, so you see just how it differs from the previous Death Stars — and how much more a threat it is to the Galaxy. Will that appease Starkiller naysayers? Probably not. We don’t find out anything more of note about Lor San Tekka — which surprised me, actually. Odds are, if we get any substantial information regarding his background and connection to Leia, we’d see it the books or the comics. Captain Phasma and General Hux aren’t elaborated upon, either. Rey and Finn are presented as on-screen, with their charm and humor intact. That’s the sort of creativity I wished I’d seen more of in the book. Extended scenes between Han Solo and General Leia Organa are just as moving as on film, and also allow a glimpse into the mysterious Supreme Leader Snoke and the reason for his interest in their son — and how far back that interest goes. However, we don’t learn much more about the politics behind the First Order, the Republic, or the Resistance. The book moves along at a nice pace — I read it in one afternoon — and sits comfortably alongside previous Star Wars novelizations. I saw The Force Awakens three times in the theater prior to reading the novelization, and one more time after reading. Was my experience of the film enriched by the book? Yes. No question. Is the novelization worth reading? Yes. While not perfect, Alan Dean Foster has written a book that captures the spirit of the film, while presenting additional (but not crucial) information that helps answer some of the questions that linger after the viewing experience ends. 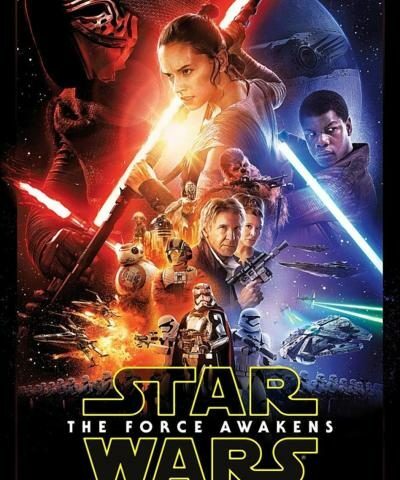 You can purchase your copy of the novelization for Star Wars: The Force Awakens here. Thank you to Del Rey for providing a copy of this book for review purposes. Hey Lisa, is ‘Book’ not ‘Hook’ at the end of the paragraph. Oops! 😉 Thanks for the catch. Yes! We never would’ve figured out you had meant ‘book’ instead of ‘hook’!! Thank goodness for the spelling police.